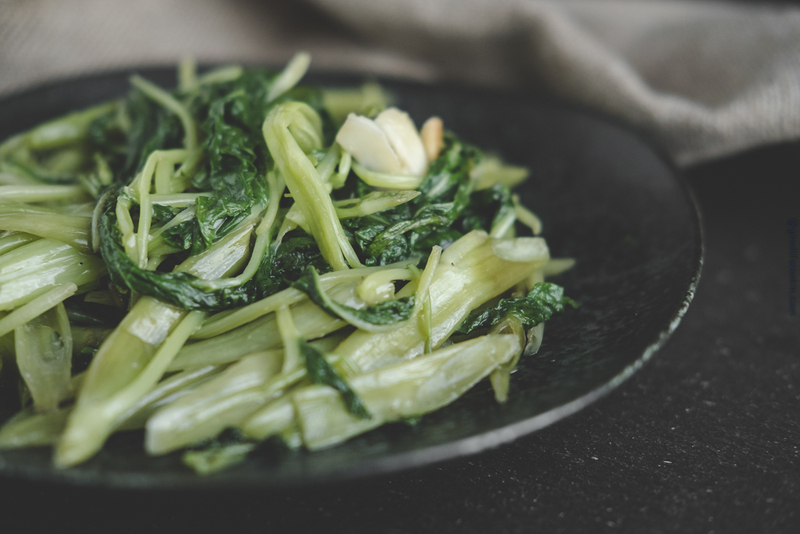 Stir-fried water spinach is one of the easiest vegetables to cook! They are hyper affordable and can be found at any Asian grocery market. What more could you want out of some greens?! This stir-fried dish is super popular in southern China and Southeast Asia and if you’re ever traveling to those areas you can always order this dish at any restaurant to live that good life. So what are the tips and tricks to making this dish taste great at home? In my opinion, you’ll need two things, a high heated wok, and fermented bean curd! The sizzle from hot oil hitting the water spinach is what we want out of this dish. The fermented bean curd is going to lend a nice salty, umami flavor to the spinach that should make your lips smack. Yes, that’s how you know it’s right! To prepare them, we’ll simply cut about an inch off the bottom of the stems. Then, cutting diagonally, we’ll run the knife up the stem and stop at the leaves. Easy! Get your colander out or something to soak and strain the water spinach. The spinach grows above water or soil which keeps the leaves fairly clean. A quick soak and rinse should be good enough to clean the water spinach. Next, we’ll prepare our fragrant ingredients of ginger, garlic, and slice of jalapeño. If you like a little more heat, just add more jalapeño. In a small bowl, we’ll mix together the fermented tofu and some Golden Mountain Seasoning Sauce. These sauces are readily available at Asian grocery markets, and will be super important to get the flavors right on this dish. Next we’ll heat up the wok to a very high temp (pretty much the highest you can go). I’d like to recommend that you have all the ingredients ready to throw into the wok at this point because you’ll want to catch the oil right before its smoking point. Throw down your garlic, ginger, and jalapeno and swirl the oil around the wok to season it. After about 10 seconds, you’ll then throw down the water spinach right from your strainer. Since it won’t be completely dry, you’ll want to prepare for a loud sizzle as the spinach hits the oil. After about 20 seconds, we’ll flip the veggies over and cook them down for 1 minute. After they start to wilt and cook down further, you’ll want to throw in the mixture of fermented bean curd and seasoning sauce. Let that all sink in for another 30 seconds, and then give a generous shake of garlic powder. I love garlic in this dish, so you can be liberal with that powder! By now, you should land somewhere at the 3 minute mark, and with a final quick toss, you’ll be done! What you’ll want is for the stems to be cooked, but still have a nice bite to them. I love this dish for its simplicity and I hope you enjoy it too! I seriously cook this dish every week because Kitty enjoys it so much. You can enjoy it by itself, or top it over a nice bowl of steamed jasmine rice. Happy eating ya’ll! A popular vegetable in Southeast Asia that's super simple to make for any occasion. Prepare the water spinach by cutting in quarters and soaking in cold water. Strain and set aside. In a small bowl, whisk together fermented tofu with a tbsp of water and Golden Mountain Seasoning Sauce. Prepare 2 garlic cloves by removing the skin and mashing them. Slice a large piece of ginger and large piece of jalapeño. Add 3 tbsp of oil to wok and heat over high flame. When oil reaches close to smoking point, add in garlic, ginger, and jalapeño and swirl around wok for 10 seconds. Add in water spinach and cook for 20 seconds, then flip over and mix around. When water spinach gets softer, pour in fermented bean curd sauce and stir vegetables. Cook for 3 minutes. Add in a generous amount of garlic powder and give a final stir. “Ong choy” or “tung choy” aka water spinach 通菜 is delicious with your recipe. A low salt option is to eliminate the fermented bean curd and add a few more garlic cloves.